The words to this famous hymn can be found below. John Mason had a vision of the songs and splendour of heaven; he contrasts this with the inadequacy of his own praise. 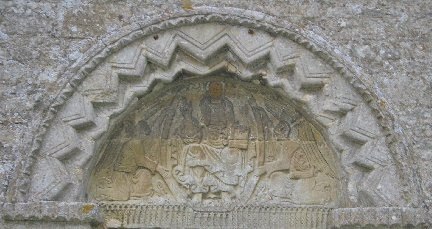 We like to think that, when he wrote of 'that majesty which angels do admire', he may have been thinking of the tympanum over our south door showing Christ in majesty surrounded by angels (above). But with God's inspiration he can 'bear a part with that celestial choir'. The fourth verse below may reflect the saying of St Augustine of Hippo: 'God is an infinite circle whose centre is everywhere and whose circumference is nowhere'. All John Mason's hymns were written in the same metre, yet he can produce both the grandeur of How shall I sing that majesty and the gentleness of Now from the altar of my heart. Together, they show Mason's strong sense of the greatness and the providence of God, His transcendence and yet His closeness. The hymn's recent popularity may be partly due to the modern tune Coe Fen. This is in the tradition of music for Trinity (a time to celebrate God's majesty) and its triple time and key signature of three flats are no coincidence. Unusually, the composer, Kenneth Naylor, adds an extra bar before the final two lines of each verse, making us pause to increase the impact of these words. Naylor (1931-91) was Director of Music at The Leys School, Cambridge, which is built on land called Coe Fen. The first four verses in the right hand column in pale grey are what are now commonly sung; comparing them with Mason's first four verses, in the left hand column shows no significant differences. His remaining eight verses are also shown below the first four, and one can see why some of them have fallen out of use! Sing, Sing, ye Heavenly Quire. And all the Earth beside! But what would shew thee Weak. That canst thou do, and more. Witness to all that's true? Lie plain before its view. Is done before thine Eye. Thou ever art the same. The Sinner's Hope and Plea! That Mercy might be rais'd. That I may praise Thee more. To Land at Canaan's Rest?